Hulthemia Hybrid Rose Finally Here! Today I went to Armstrong Gardens to look at their roses– last year they were selling some David Austins– and look what I found! A rose breeder named Jim Sproul, who works out of Bakersfield, was instrumental in helping me out with THE CARE AND HANDLING OF ROSES WITH THORNS– he told me about the rose he was trying to breed, the Hulthemia, so that’s what my character breeds in the book. He also described the rose breeding process and lots of other details. In the novel, the main character, Gal, is very close to perfecting the Hulthemia for the commercial market, and it’s finally happened in real life after 200 years of trying! For nearly 200 years, rosarians have tried to breed the beautiful species Hulthemiapersica with garden roses. Closely resembling a wild rose (to which it is almost certainly related), Hulthemia persica is distinguished by a dark red spot at the base of each petal, and it is this spot that rose breeders wanted to hybridize. Thanks to the pioneering efforts of Harkness and others, breeder Jim Sproul has developed two breakthrough hybrid hulthemia roses, and we are honored to introduce them here. 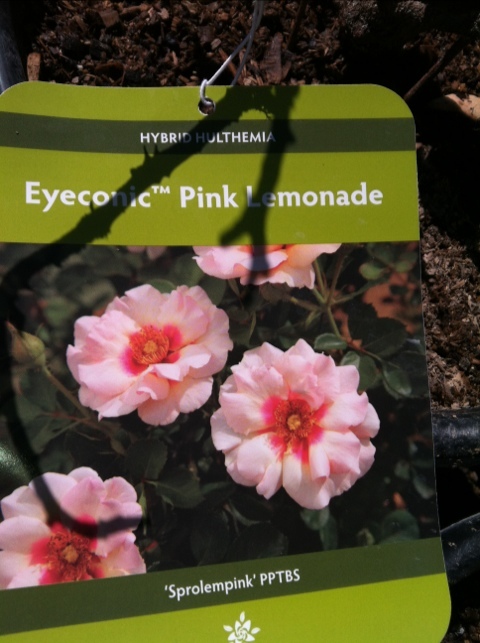 Welcome the Eyeconics™, perpetually blooming, self-cleaning, highly disease-resistant roses with “eyes”! I went and found an Armstrong employee to ask about them. “We don’t carry those,” she said. “I’ve never heard of them.” I had to walk her over and she hadn’t seen them before. She said you can grow ANY rose in a pot, which I’d need to do. I’m not entirely sure about that (and since she hadn’t heard of them, she might not know everything about roses), so I have to do a bit of research first. How cool. WHat a beautiful plant!!! Thanks for letting us know. I kill everything I even walk near but hubs is a great gardener and maybe he’ll try this one. Our last find was the knock out rose which it seems according to gossip that you cannot kill. Ours is still living in this stupid ohio climate after two years! Whew. Poor rose. Wow, that’s a gorgeous rose! Will have to tell my husband. He’s the master rose grower in our family.